The story of American Indians in the 20th century is an inspiring tale of survival and rebirth from the depths of defeat. At the dawn of the 20th century, the Indian was seen by non-Indians as the "Vanishing Red Man," a symbol of nostalgia, a figure of the past with no future. Yet not only have American Indians adapted and survived, but they have brought their talents and unique cultural perspectives to many fields. 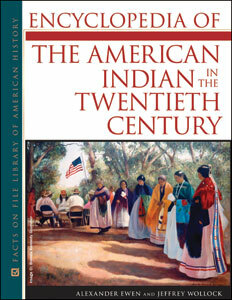 In an easily accessible A-to-Z format, Encyclopedia of the American Indian in the Twentieth Century contains a comprehensive range of entries—from biographies to concise analyses of major events, organizations, and important topics—that provide an overview of the history of American Indians in the 20th century, a story less known but no less dramatic than that of the period of first contacts and wars. Profiles are included of key individuals, events, ideas, organizations, and locations that have defined American Indian history since 1900. An important addition to the study of multicultural history, this authoritative encyclopedia provides one-stop access to insightful information not readily available in other sources. Alexander Ewen, a member of the Purepecha Nation, holds a B.A. in history from the University of Virginia. An award-winning Native journalist, he is a founder of and contributing editor to Native Americas, a member of the Native American Journalists Association, and editor of Voices of Indigenous Peoples and Chiapas: Challenging History. He has written numerous articles, chapters, and papers about Native American issues. For the past 15 years, he has been one of the leaders of the 40,000-member New York City Indian community, one of the largest Indian communities in the United States. Ewen serves as director of the Solidarity Foundation, which he co-founded in 1987. He lives in New York. Jeffrey Wollock has an M.A. in English from Memorial University of Newfoundland and a D.Phil. in history from Oxford University. He has worked for the Solidarity Foundation since 1989. Author of The Noblest Animate Motion and coeditor of Benjamin Rush’s Lectures on the Mind, Wollock has published more than 40 scholarly articles. He lives in New York.